Could ‘Financial Weather Observers’ Prevent Another Economic Crisis? Question: As I read deeper into the details about the financial crisis, it seems the root condition that capital is ‘capitalizing upon,’ excuse the pun, is the transitional inefficiencies affecting the integration of formerly hegemonic national economies into a global economy that has no hegemony itself yet except through national institutions and their infrastructures built to benefit national aspirations and expectations. I’m thinking, in our information age, with speedy computers already well integrated into Wall Street and bank practices, that some useful order could best come from better transparency and accountability. Consumer and investor ignorance was a major factor explaining how banks and hedge funds managed to stimulate and nourish the housing market investment frenzy. The main culprit, of course, is the collateralized debt obligation (CDO), in which case the classic linkage between lender and borrower was cut; and, too, clever ways were used with CDO’s to hide the true risk picture from investors. This didn’t happen because capitalists are natural crooks, they are cultivated to find advantage where they can. By the same token, they cannot be counted upon, on their own, to do away with very lucrative ignorance without having their arms twisted by observers for the general public interest who have the powers to see through the smoke and mirrors. Here’s my transparency fix. 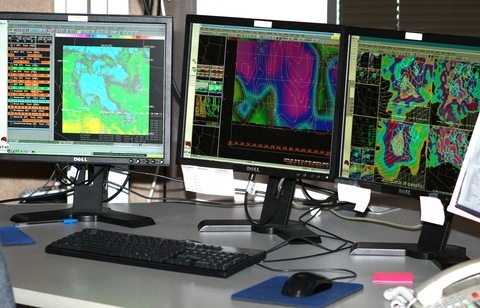 We hire some qualified market observers, we purchase the same giant computers used by the National Weather Service to forecast the weather, and we require financiers to supply real-time data on all transactions for processing. The Financial Weather Observers essentially monitor the movements of capital the way weather forecasters monitor the weather; they use the same sorts of data mining programs Wall Street organizations use to study market movements and predict possible killer storms. National Weather Service computers in Flagstaff, Ariz. Photo by Flickr user bill85704. The idea is to be able to foresee strange, possibly dangerous activities before they become pathogenic, or viral, and monitor closely those players working at the outer reaches of risk — all anonymously. What I’m suggesting is simply giving public referees computing power on a par, and synchronized with, what banks and Wall Street institutions are using already. What do you think about my transparency solution for aligning national prerogatives and globalizing opportunity in a transitional environment? Paul Solman: Yes, the globalization of the world economy is running ahead of the world’s ability to regulate or even effectively monitor it. But isn’t that also true at the level of the nation-state? And of politics — and technology, for that matter? And yes to transparency. MIT finance guru Andy Lo has long proposed the financial equivalent of a national traffic safety commission or NASA inquiry board to analyze the Crisis of ’08. Indeed, an analysis along the lines you’re describing was performed on last May’s “flash crash,” as I understand it. But don’t hope for magic cures. I’m not as cynical as you about capitalists as “natural crooks,” but as you point out, their job is “to find advantage where they can.” They’re paid to push the envelope. So when the world tries to constrain their efforts at exploiting profit opportunities they find new ways around the constraints, the devil sometimes be damned. Besides: systems like the weather — or seismic activity, as we’ve so stunningly seen — seem to exhibit a chaotic tendency that doesn’t tell us enough, until it’s too late.